An investigation is under way after more than 40 firefighters tackled three separate grass fires in Aberdeen. Crews were first called to an area known as "The Gramps" near Kincorth in the south of the city at about 20:00 on Sunday. There was a further outbreak at nearby Tullos Hill. 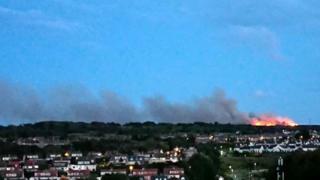 Then, just after 22:00, a gorse fire broke out in the north of the city near the Royal Aberdeen golf club.